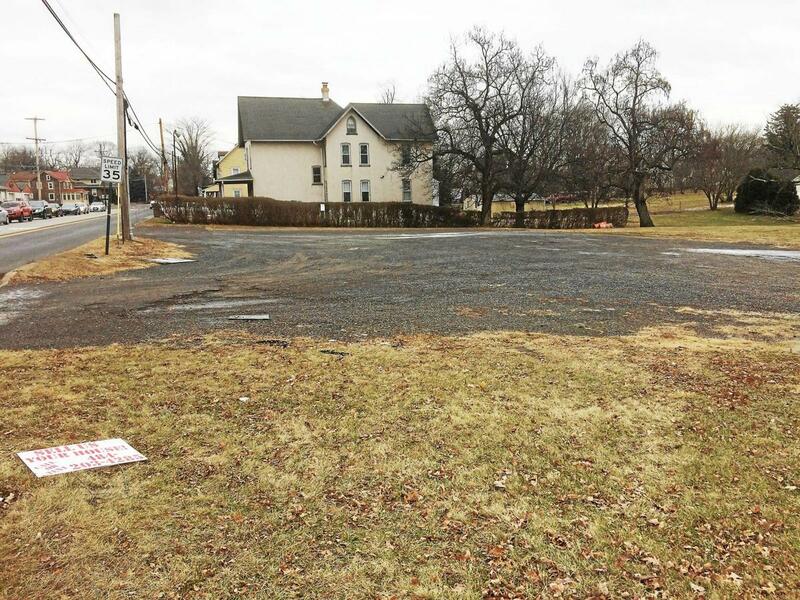 In addition to the vacant land at the southeast corner of East High Street and South Pleasantview Road in Sanatoga, the township also purchased several structures last year, like the one shown here, along with the parcels on which they sit. Thursday night, the Lower Pottsgrove commissioners voted unanimously to seek bids to demolish those buildings. Last night the Lower Pottsgrove Township Commissioners voted to knock a few buildings down, to clear unshoveled snow and cut unmown grass. And they opened another chapter in a long running dispute about who has responsibility for a driveway that serves three homes in Pleasantview Estates. The grass cutting and snow clearing were part of two ordinances advertised (and written about) last week. Essentially they gives the township the power to have its employees go onto private property and cut grass and weeds on a property that is not responding to notices of violation for said grass and weeds. Also, when snow is not cleared off sidewalks within 24 hours of a snow storm, township workers can now do it and impose a tax lien on the property owner responsible for clearing it. As I wrote last week: Township Manager Ed Wagner said ordinances are already on the books, but only allow the township to fine those who don't clear their sidewalks of snow or cut their grass and weeds. What the two new ordinances do is authorize township workers to go in and get the work done. a tax lien — plus a 10 percent penalty — is then imposed on the property for the cost of doing the work. The township gets its money when the property changes hands. Before going onto a private property to cut the grass, the township will provide written notice of the violation and the owner has five days to correct the situation, according to the legal notice. The cost of clearing a sidewalk or clearing grass and weeds will be include in the annual township fee scheduled and updated as need requires, said Wagner. In addition to the cost of the work, the grass cutting ordinance also imposes a fine of $600 "plus the cost of prosecution" and "each day that a violation of this ordinance continues shall constitute a separate offense." As for the demolition of buildings on High Street, the infrastructure committee has been moving steadily toward a recommendation to build a new township building at the site it bought about a year ago. As Township Commissioner Ray Lopez reported recently, design on the new building is expected to begin on a new building in the next few months. The bids for demolition are a step toward making more space for a larger footprint for the building. The current township building on Buchert Road is 7,500 square feet and was dedicated in 1990 when the township population was 8,808. It now stands at 12,164. Most of the meeting was taken up with discussion of the status of a road with no name. Located off Deer Ridge Drive in the Pleasantview Estates sub-division, it crosses a watercourse and provides access to three homes there. It's a thorny legal thicket of documents, definitions and drama, with the residents insisting a deed shows the township owns the road, and thus is responsible for repairing it. The development was begun in 1989 and, unusually, Bursich Engineering, which was been the township's engineering firm for longer than most people can remember, was working with the developer. So the township had to hire another firm to review the plans on its behalf, said Township Manager Ed Wagner. Thursday, Township Solicitor Charles D. Garner Jr. went through a lengthy description of his investigation of the matter, which concluded that while all other roads in the development were deeded to the township and -- most importantly -- accepted by the township, this one was not. Further, he argued, a note on the engineering plan filed at the county, and on at least some early version of all three deeds, that the owners of the three properties are responsible for one-third of the "maintenance" of the road. One resident, Steve Smith, said the residents believed "maintenance" meant clearing it of snow, and debris and that a 1999 deed of dedication of the road to the township meant the town owns it and must repair it now that increased water flow is beginning to cause problems on the properties. Garner said there is now record of the township voting to accept the road, although he did allow, hypothetically, that it is possible for the township to be deeded property that is not a road and that therefore would require no vote. All the commissioners would promise to do at this point is look into the cause of the water problems there. But as for the larger issues, both sides repeated the same phrase: "It isn't ours."